Most Rye residents are not opposed to better wireless coverage however, upon review of many of the statements made by proponents of the Rye/Crown-Castle cellphone antennae project, it is abundantly clear that an effort needs to be made to separate fact from fiction. The Facts: Smart home buyers will use antenna perception as a negotiating point to reduce the price they pay for a new home in Rye. The Facts: The Rye antenna project is a government taking. Many property owners in Rye are having their property values lowered without due process of law. This violates the fifth amendment. Facts: Tax certiorari lawyers representing property owners will leverage cell phone antenna property value data to achieve significant tax assessment reductions through assessor negotiations, the grievance process and litigation. The estimated present value of lost real estate taxes for each antenna is $60,000 – $80,000. The present value of fifty antennas would represent $3 million – $4 million in lost tax revenue for the City of Rye (assumes $20,000 average annual property taxes per affected home). The Facts: Antennas reduce property values and therefore reduce school tax revenue. The Facts: Hiding antennas may trick unsuspecting buyers to pay more than a home is worth but it doesn’t change the fact that cell phone antennas negatively affect home value. The Facts: This is anecdotal and proves nothing. Many non-representative real estate transactions occur as the result of buyers acting imprudently and without complete knowledge about hidden defects and property value issues. The Facts: While it’s true a handful of pole-mounted antennas exist in Rye, two wrongs don’t make a right. The pre-existing antennas were installed quietly without ample consideration of the facts, the law and other matters. The Facts: Even buyers who don’t care about antennas will likely use antenna proximity to negotiate a lower price. Property value is a function of supply and demand. Antennas reduce demand and therefore property value. When it comes to hand-outs, Rye basement-builder welfare runs deep. The city’s basement FAR loophole amounts to a government subsidy that distorts the housing market and creates artificial incentives to hammer, chip and blast rock. The loophole exists because our zoning laws are not keeping up with technology. Under the Rye city code, basements are still treated as a place for spiders and rusty water heaters rather than the modern climate-controlled entertainment space that exists under most new homes. Does this mean we should outlaw basements? Of course not, but there are good reasons to count basements as livable space like other rooms in the house. While homebuilders routinely balance the size of kitchens, family rooms and bedrooms based on lot size and FAR there is no opportunity cost of adding a basketball court sized basement. 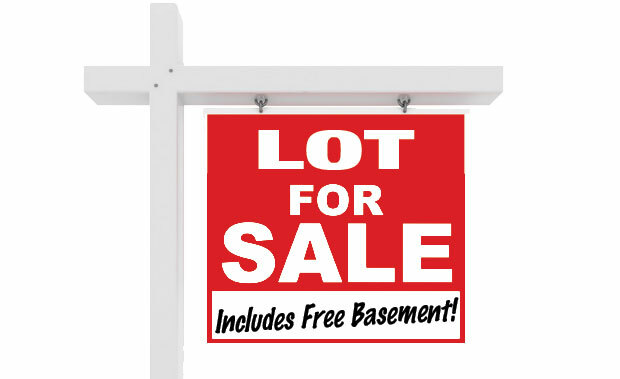 Because of the basement FAR loophole, basements are protected from the free market process that governs the size of other rooms. New basements and healthy real estate margins are natural and in many ways, desirable features of Rye’s robust real estate market. In a well-planned and well-balanced community, economic incentives help keep the system rolling. But loopholes in our zoning distort the market and create unintended consequences like monster basements and rock hammering that impact landowner rights to quiet enjoyment. As our community continues to debate the need for a stricter noise ordinance, it would help to close the loophole and treat all livable space evenly. The basement FAR loophole is a symptom of Rye’s outdated zoning and master plan; looking forward, a master plan and improved land-use regulations will not only help preserve landowner rights, but also ensure long term economic sustainability. Can Rye’s real estate professionals do more to ease the RCSD budget burden? Healthy real estate commissions and development margins are natural and in many ways, desirable features of Rye’s robust real estate market. In a well-planned and well-balanced community, economic incentives help keep the system rolling. But they are also kept in check, lest they cause hardships in the greater community. Real estate professionals, in adding hundreds of new bedrooms and upending the balance of school users and non-users, aren’t just just following the market, they’re driving up Rye City School District costs and creating hardships for long time residents and empty nesters. Given this windfall, and in the face of a school budget gap, is it time for real estate professionals, who have done so much to drive the increased school costs and enrollment, to give more back? The RCSD budget gap and school overcrowding are symptoms of Rye’s outdated zoning and Master Plan. Looking forward, a master plan and improved land-use regulations will not only help address budget and school overcrowding issues, but also long term economic sustainability challenges. While there are laws that govern house size above ground, below ground its a free-for-all. The basement zoning loopholes are leading to disruptive rock hammering, overflowing sewers and other serious issues. Now is a great time to close the Basement Floor Area loophole. Ever wonder why sewage bubbles out of man holes in Rye after it rains? Monster basements are a large and growing part of the problem because they put stress on Rye’s fragile sewer and storm drain infrastructure. This in turn, causes pollution, unsanitary street conditions and exposes the city to legal risk and fines. In specific Rye locations, the value of this “free” loophole basement space may exceed the cost of excavation — even when extensive rock chipping is required. 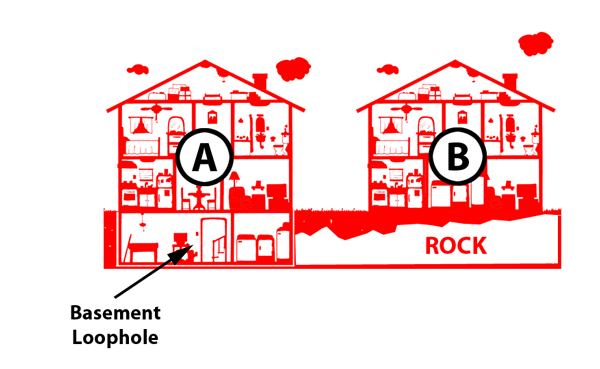 If zoning rules were amended to account for livable basement space (in a similar way the attic rule was recently adjusted), this would help close the loophole and create less incentive for rock-chipping. Rock-chipping is a symptom of Rye’s outdated zoning and Master Plan. Looking forward, a master plan and improved land-use regulations will not only help address rock-chipping issues, but also long term economic sustainability challenges. Rental Property Companies, Unfair Burden on Rye Taxpayers? While rental properties are an important and necessary component of the Rye housing stock, some real estate companies may be taking advantage of zoning and assessment loopholes in ways that negatively impact the community. For example, an Armonk based development company has amassed a significant rental home portfolio in the City of Rye. Currently this company is renting 20 family-purposed homes consisting of 66 bedrooms that can accommodate between thirty and forty school age children. This company pays approximately $125,891 dollars in RCSD school taxes annually, enough to cover only 5.7 children ( source: City of Rye Roll, egovlink.com, RCSD Budget, ryecityschools.schoolfusion.us). The unrecovered cost of these twenty homes to the Rye City School District is approximately $640,000 annually. Furthermore, while the company is only paying a small share of taxes, it is able to charge premium rents (approximately $1.6 million annually) due, in part, to the outstanding reputation of the Rye schools (source: zillow.com). 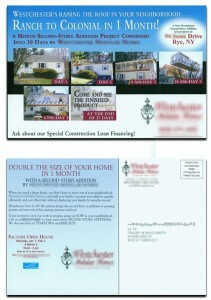 Taken together, the Armonk based development company is costing the Rye community $640,000 annually, while capitalizing on Rye’s outstanding reputation. Looking forward, a master plan, improved zoning and revised assessment guidelines may help mitigate the current imbalance and better ensure a sustainable community going forward. Where do the BOE Candidates Stand? Some active members of the community advocate for bigger houses and higher taxes to pay for bigger schools and growing city services. Others in the community are questioning the “bigger is better,” approach and are hoping the City Council will update the master plan and take steps to help balance the city housing stock. Unlike neighboring municipalities, Rye does not have a master plan so we don’t know if big decisions being made by the real estate community today are compatible with the city’s vision for the future. After extensive debate and public discussion, the City Council passed a resolution to amend local law Chapter 197. The resolution essentially restores the attic FAR rules to the way they were in 2006 before New York State created a loophole. While this is encouraging, the revised law does little to address the need for master planning and economically sustainable development. The Rye City Council is considering a local law to amend the City Zoning Code to change how attic space is included in the calculation of gross floor area for single-family residences. 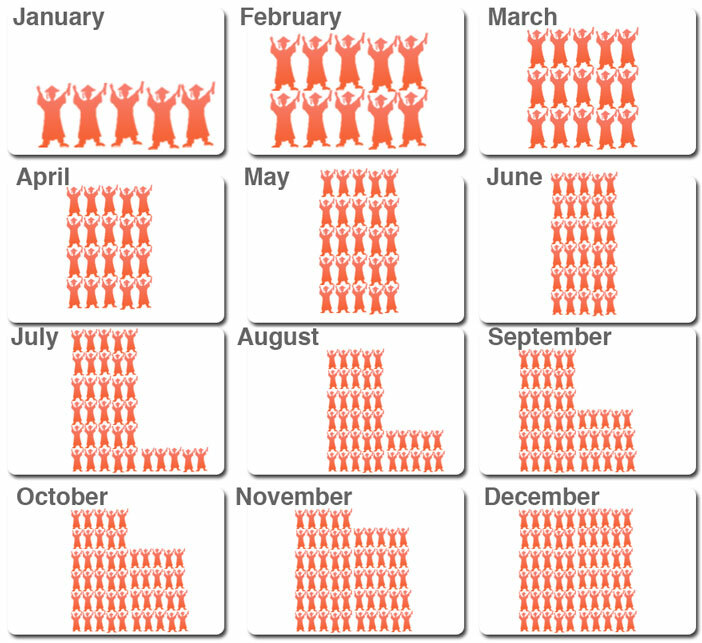 The proposed law is intended to address concerns about the bulk, mass, scale of housing. Fact: While it’s true, lowering roof pitch is one way to respond, builders and architects have many other options. Where do the Candidates Stand? Click here for candidate answers. By law, zoning depends on a “well-reasoned master plan.” The master plan is important because it promotes economic development and guides land use decisions compatible with the city’s vision for the future. Unfortunately, unlike most neighboring municipalities, Rye does not have a valid master plan; instead, special interests and federal agencies are planning for us. Master planning and zoning are strongly rooted in property rights. An important goal of zoning and master planning is to extend individual property rights up to (but not past) the point where the rights of others are negatively impacted. Nobody wants to be told what they can do with their property, but then, who wants a toxic landfill placed next to their home? We don’t want to be told we can’t replace a three bedroom, senior-friendly ranch, with a five bedroom, family-friendly colonial, but then, why should neighbors pay more school taxes and endure class-overcrowding when RCSD enrollment increases? Nobody wants to be told not to build near a stream, but who wants to increase the floodplain and hike public tax liability for flood relief? Master planning isn’t perfect but it’s a great way to help address these challenges and balance community needs. Unfortunately, unlike neighboring municipalities, Rye’s master plan is obsolete and no longer valid. By comparison, Greenwich, Bronxville, Scarsdale, and Mamaroneck recently adopted plans and Cappaqua/New Castle are very far along in the process. Rye's Master Plan was adopted in 1985 and is very old and obsolete compared to neighboring municipalities. Many Rye residents are alarmed by the current pattern of land use and recognize the need for a coordinated vision for the future. Adopting a master plan is a great first step in addressing land use challenges for current and future generations of Rye residents. The bigger the home, the less likely empty-nesters will stick around after their last child leaves the RCSD. This turnover effect is likely a significant long-term driver of RCSD enrollment because large homes are more likely to be consistently occupied by heavy-users of the RCSD. Surveys show empty-nesters and seniors prefer not to live in homes with lots of stairs and bedrooms; they also don’t like paying for extra utilities and upkeep. Instead, these non-users of the school system prefer homes that eliminate steps and provide a master bedroom on the first level. 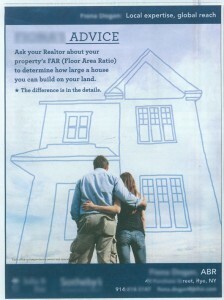 (source:National Association of Home Builders nahb.org). Last week the RCSD announced 3,316 students are enrolling for the 2013-2014 school year — one hundred more than planned. 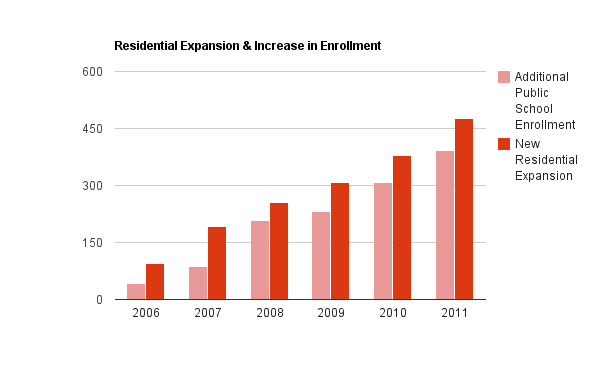 Between 2006 and 2013, housing stock and RCSD enrollment increased by 629 expansions and 438 students respectively. 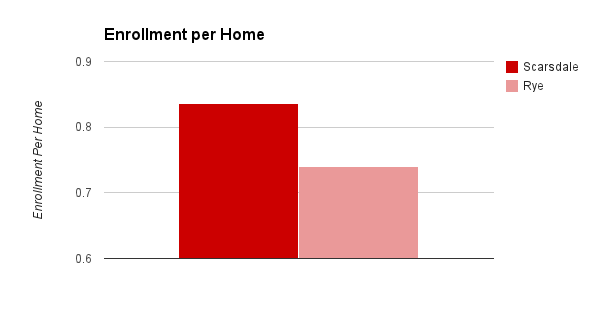 Is this a coincidence or is there a link between the wave of residential expansion and increase in RCSD enrollment? Is Rye Becoming More Like Scarsdale? Compared to Rye, Scarsdale has higher home turnover, higher enrollment per home and higher school taxes per home. Is the current housing-stock transformation making Rye more like Scarsdale? More research and an updated City Master Plan is required to better understand the relationship between development, home turnover, RCSD enrollment and school taxes. 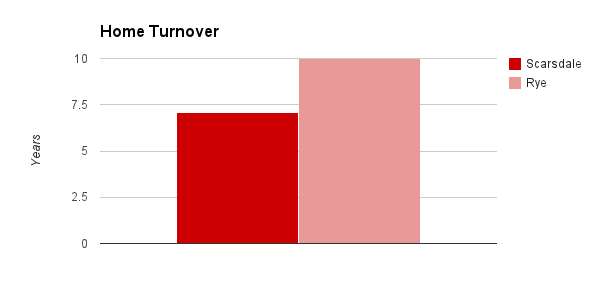 (note: There is approximately thirty percent faster turnover in Scarsdale compared to Rye. On average, homes turnover every ten years and seven years in Rye and Scarsdale respectively. 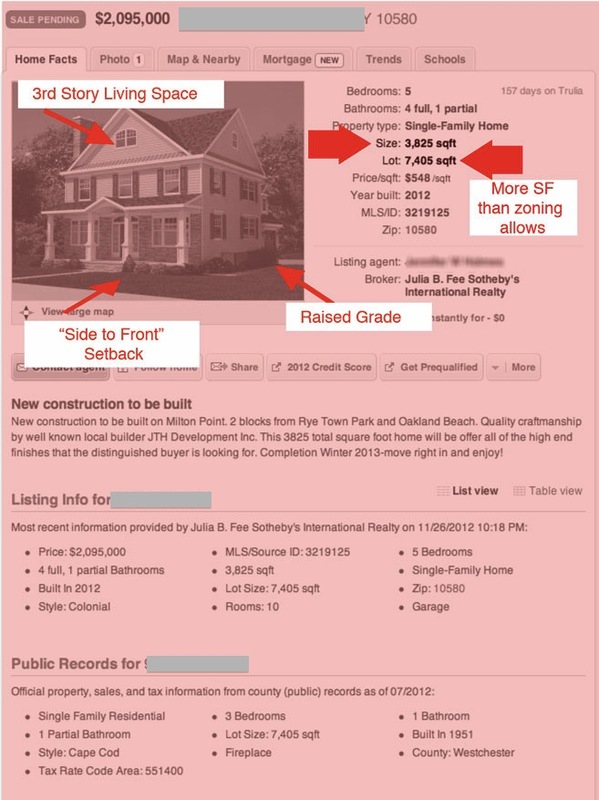 Source Trulia.com). 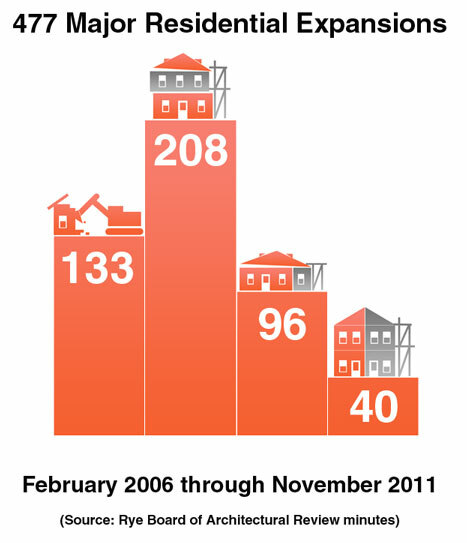 Rye experienced 629 major residential expansions since 2006. 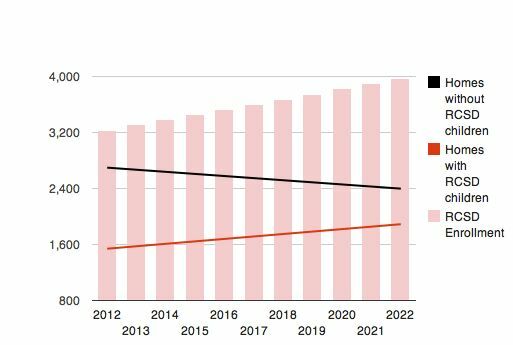 How will this significant change in housing stock affect taxes, turnover, school enrollment and the number of RCSD “heavy-usersr?” Nobody really knows. More research and an updated Master Plan are needed to meet the needs of the present without compromising the needs of future generations of Rye residents. Is Turnover Driving School Tax Deficits? Only a small percentage of households in Rye pay enough school taxes to cover the cost of two children in the RCSD. Even most large new homes do not pay enough taxes to pay for two students. The gap is the school tax deficit. While it’s true, higher assessments on large new homes provide more school tax revenue, there’s reason to believe high assessments may also increase turnover and that this, in turn, creates a larger school tax deficit. 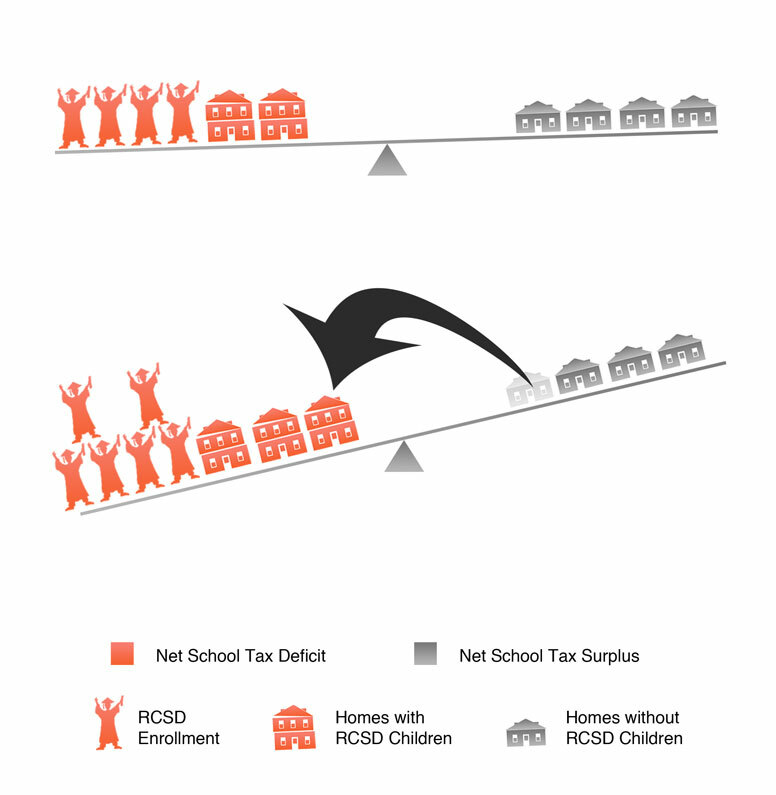 In the case study below, a large home assessed at $50,000 has more than double the cumulative school tax deficit of a smaller home assessed at $25,000. A more detailed analysis is here. An updated City Plan and more research is required to better understand the important relationship between home size, assessment, turnover and school tax deficits. Taxes and school budgets are complex but one thing is simple: “non-users” subsidize “heavy-users.” Seniors, empty-nesters and other non-users of the RCSD subsidize the education for heavy-users of the RCSD. In today’s joint meeting of the City Council and the RCSD Board of Education there was a good deal of discussion about how to address the challenges posed by the Property Tax Cap. While tax cap overrides, private fundraising, issuing bonds and cutting programs are short-term tactics, City Planning may be part of the solution in the long run. Fact is, if the City of Rye had a higher ratio of RCSD non-users to heavy users of RCSD, then there wouldn’t be a school budget problem. However, when this ratio reverses, the financial impact works in the opposite direction; funding becomes more burdensome for many, and intolerable for others and ultimately threatens curriculum standards. There are many factors that drive this ratio and city planning is one of them. Rye’s Plan was adopted in 1985 and expired in 2000. Perhaps now is a great time to dust off our City Plan and make sure we’re doing everything we can to encourage real estate professionals to align our city’s housing stock with the long term needs of our community. 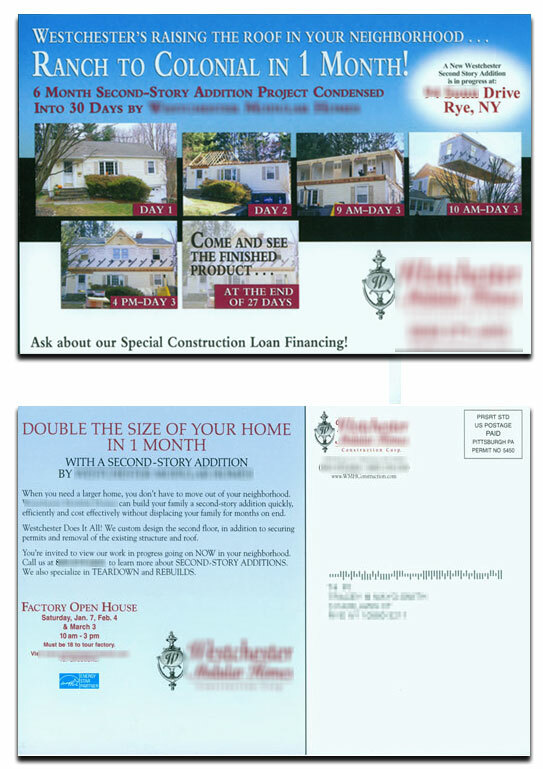 While it’s true the plans for this new home were approved without a variance, this advertisement touts the fact the house is more than 120 square feet larger than current zoning allows — enough for an extra bedroom. How will this affect the city? Nobody really knows. More research is required to better understand how building bigger houses and adding more bedrooms on lots like this may affect resident turnover, RCSD enrollment, and school taxes. "Ask your Realtor... how large a house you can build on your land." "Ranch to Colonial in 1 Month"
From Maine to Seattle, communities across the U.S. are creating incentives to develop and preserve cottages to enhance the tax base without adding children to the local school system. Cottages are also a great way to keep empty-nesters, seniors and other RCSD non-users living in their hometown. Rye has hundreds of cottages that contribute to the tax base without adding children to the RCSD. Lots of statements are being made about Rye zoning, schools and taxes. Here’s an attempt to clarify the facts and help create a plan for the future and spark helpful and constructive debate about what’s best for our community. Is This the Sound of Higher School Taxes and School Overcrowding? There are hundreds of ranches and cottages in Rye being replaced by homes that target heavy users of the Rye City School District. How will this trend affect school taxes and turnover? Nobody really knows. More research and a revised Master Plan are required to know if the path Rye is traveling down is economically sustainable. Will Residential Expansion Lead to $35,000 School Taxes? Rye school taxes (average $18,000 per residence) are comparable to other locations in Westchester, but that could change if the current trend in residential expansion continues. The graph above shows about forty percent of residences located in the RCSD (about 1,500 homes) accommodate heavy users of Rye City Schools; in ten years this is may jump to eighty percent (about 3,000 homes) leading to average taxes of $35,000 per year. While a reasonable amount of housing-stock turnover is desirable, there are good reasons to update the Rye Development Plan and take steps to create a balance between households that are heavy users of the Rye City schools and households that are not. 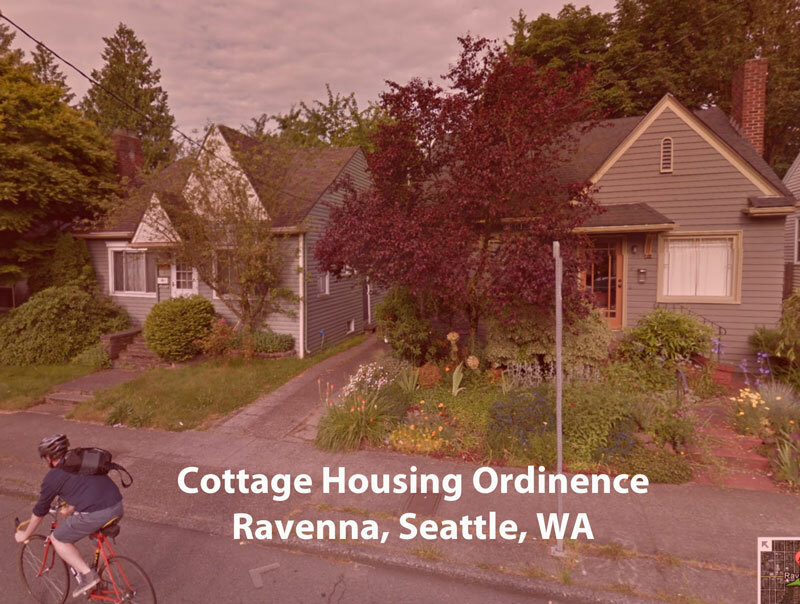 There are currently hundreds of cottages and ranch homes (possibly well-suited to empty nesters) poised to be torn down and converted to homes for heavy school users. While it’s true, residential expansion has many economic benefits, there’s evidence the Rye City School District is bearing a significant cost. 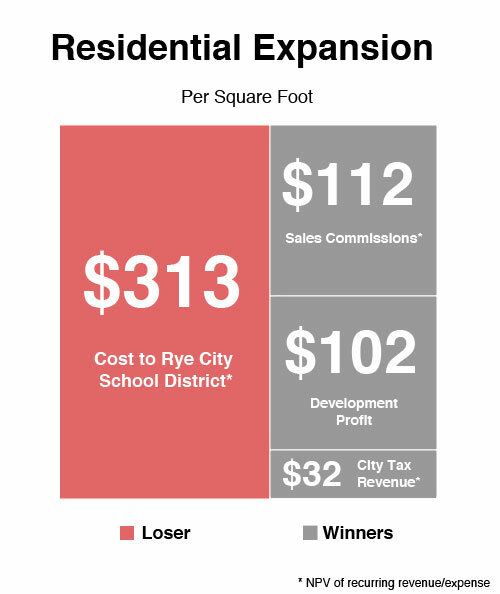 For each square foot of new residential expansion, the RCSD may be losing as much as $313. 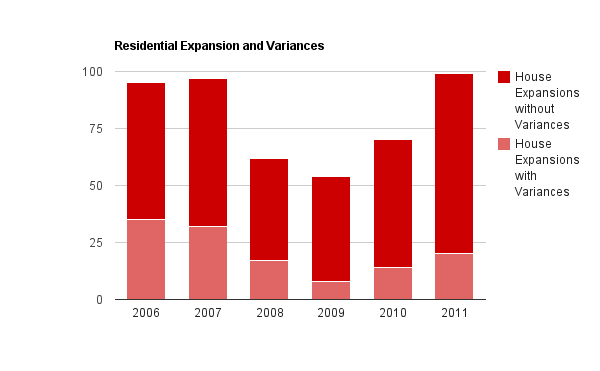 See residential expansion economics for more assumptions and detail. There’s evidence residential expansion is adding as many as five new students per month to the Rye City School District (RCSD) — that’s more than two new classrooms per year. Coincidence? 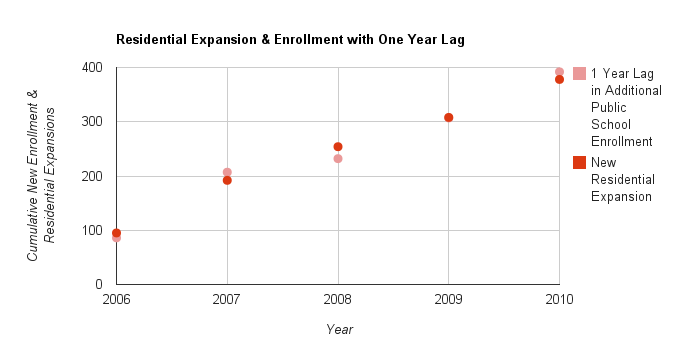 The chart below shows a remarkable correlation between residential expansion and school enrollment one year later. While these statistics are intriguing, correlation doesn’t necessarily imply causation; more research is required to find the precise relationship between residential expansion and school enrollment. Each time a high-turnover, children-purposed home displaces a low-turnover multi-generational home, the balance shifts towards higher school taxes and school overcrowding. Homes without school-age children benefit the Rye City School District (RCSD) because, like an endowment, they help pay for education without affecting enrollment. For this reason, it’s important to have a healthy ratio of homes with and without school-age children. If this ratio becomes skewed, the community reaches a tipping point which, in turn, can lead to polarization and instability. 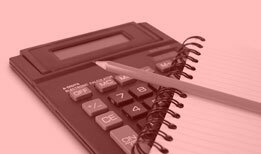 According to the 2011 Roll, annual school taxes on most homes (more than eighty percent) are less than the cost of educating one student in the Rye City School District (RCSD). While it’s true, overall assessed value may increase, residential expansion burdens the school district — while depleting the stock of homes that bolster the district. The illustration above shows the imbalance caused by this double-effect. New houses specifically designed for heavy users of the RCSD are displacing houses suitable for light or non-users of the RCSD. 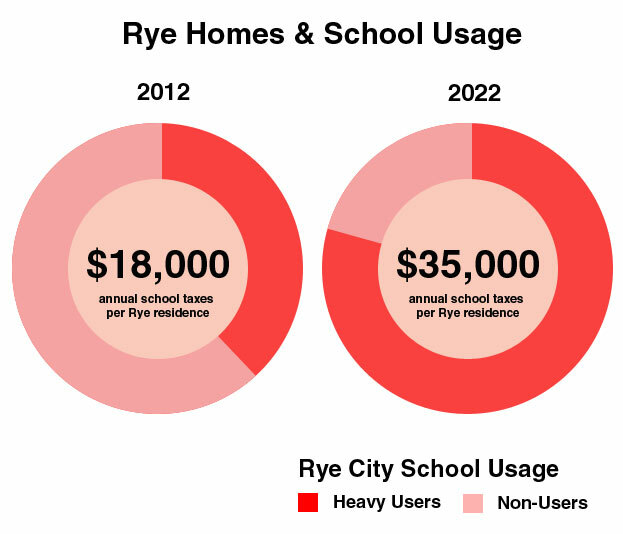 The chart above illustrates how current residential expansion trends may impact Rye’s housing stock and school enrollment. Assumes seventy Rye City School District home expansions per year; 1.05 RCSD children per expansion; overall housing stock growth of five homes annually. While it’s true, residential expansions boost assessments, there’s strong evidence residential expansions also increase overall school-tax burden for all Rye residents. 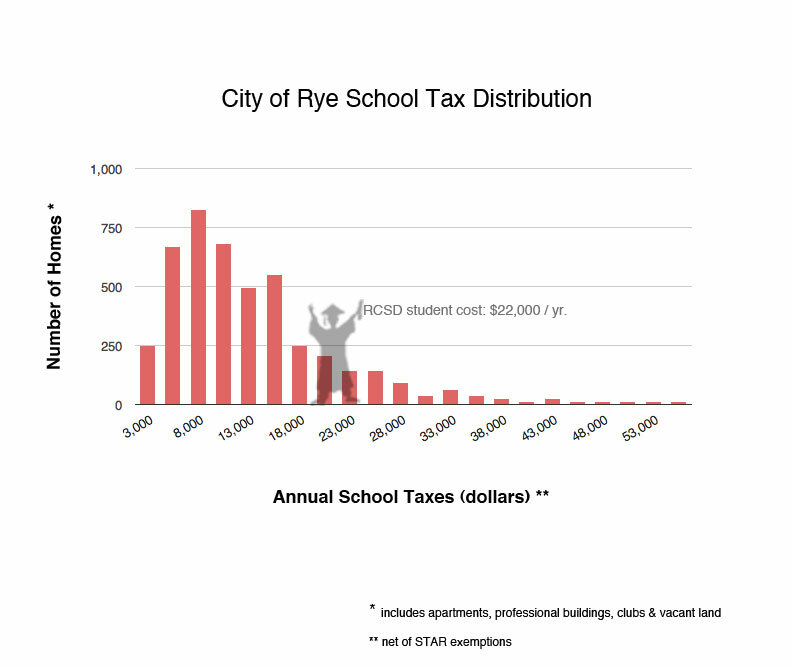 The chart below shows eighty-five percent of Rye homes (including new homes) do not generate school taxes to match the cost of just one student. 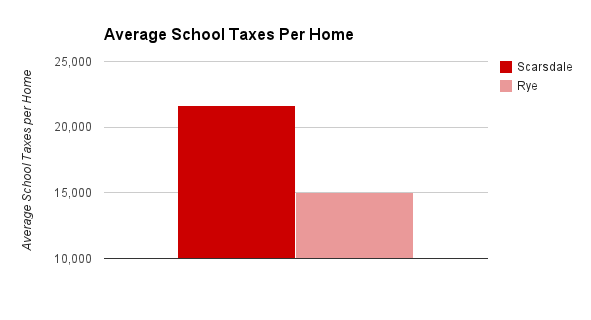 Ninety-seven percent of Rye homes do not generate school taxes to match the cost of two students. 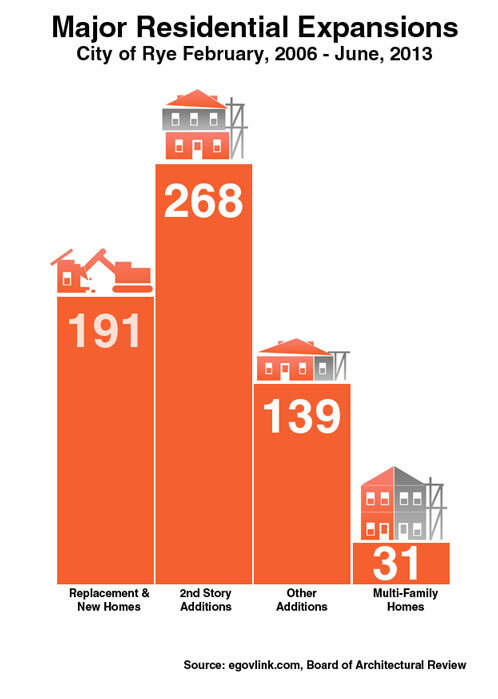 There were 477 major multi-bedroom residential expansions between February 2006 and November 2011 including 133 tear-downs/subdivisions, 208 major second story additions, 96 single story additions and 40 muliti-unit residences. Taken together, these expansions are roughly equivelent to 159 new three-bedroom houses. More research is needed to fully understand the impact this residential expansion has on school enrollment, school-taxes, housing stock, affordability, and city demographics. Residential Expansion, School Overcrowding Link? While it’s true, more research is required to determine if there’s a link between residential expansion and school enrollment, the data show more bedrooms are being added to housing stock while school enrollment is increasing. The graph below shows that since 2006, school enrollment and house size increased by 392 students and 477 major additions respectively. Most residential expansion is “as of right,” meaning there’s no requirement to obtain a zoning variance. 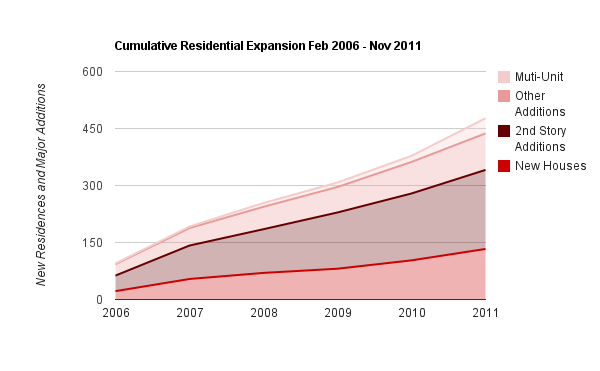 477 major residential expansions since 2006 –the equivalent of 159 new three-bedroom houses. 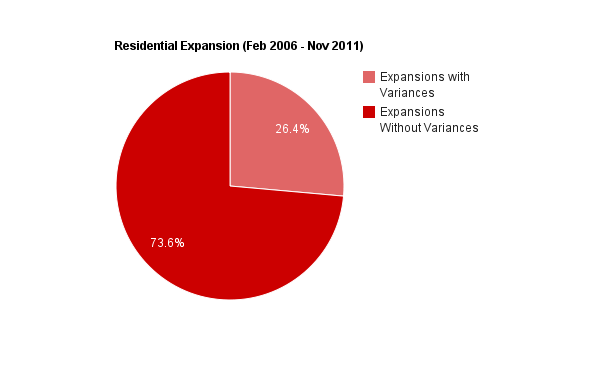 Since 2006, twenty-six percent of residential expansion required zoning variances seventy-four percent did not. The economics of the RCSD and Rye Real Estate are tightly coupled. 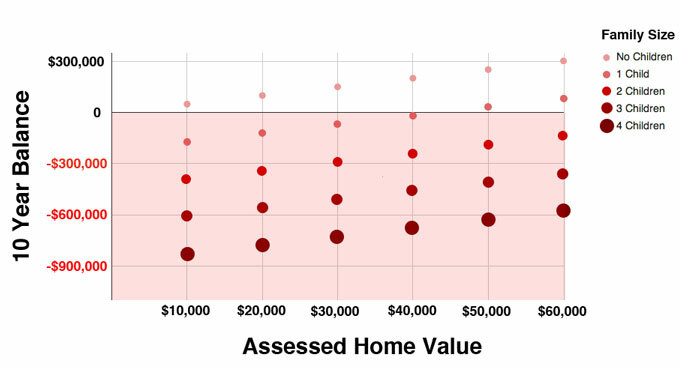 Housing stock turnover commissions and development margins are linked to home values which, in turn, are correlated to the quality of our schools. 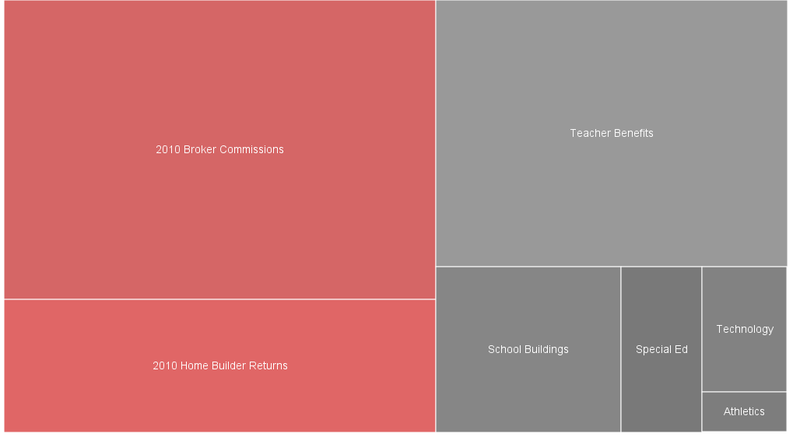 The graph below shows the size of 2010 broker commissions and home builder returns in proportion to important components of the Rye school budget. For many households, there’s a gap between school-taxes and the cost of educating children enrolled in the Rye public schools. The difference depends on the home’s assessed value and the number of school-age children enrolled in public school. 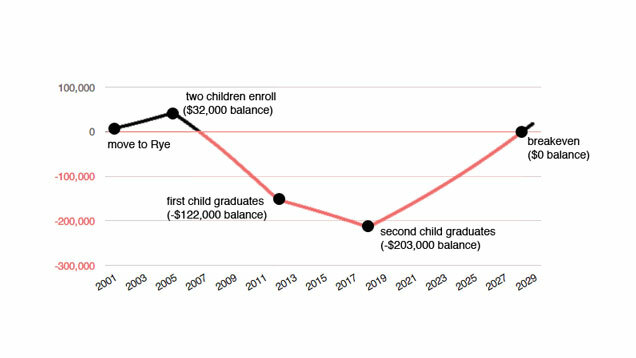 The following graph shows the “ten year balance” per household based on the number of children enrolled in Rye Public schools and home assessment value. The ten year balance is the total amount of educational expenses incurred minus total school taxes paid during the same period. For example, over ten years, two children enrolled in public school and living in a home assessed at thirty thousand dollars, will incur approximately $288,000 in educational expenses, net of school taxes paid. Put another way, it takes 2.8 no-child households assessed at twenty-thousand dollars to offset the unfunded education expenses (cost of education – school taxes paid) of one two-child household assessed at thirty-thousand dollars. 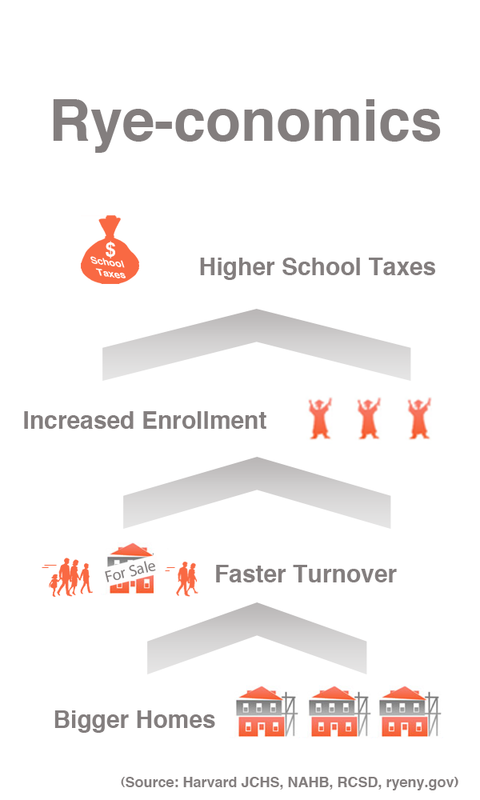 To match the cost of education, school taxes are paid many years after children graduate.